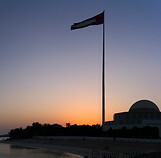 At the southwestern end of the Corniche road there are a number of upper end sites such as the Emirates Palace hotel, the Etihad towers, the Presidential palace and the Marina island. The Emirates Palace is an expensive luxury hotel with 1.3km of own beach and a large garden. Next to it are the Etihad towers, a complex of five sophisticated skyscrapers with a special glass surface design. The Marina island contains the Marina Village, the Marina shopping mall and the heritage village. The heritage village is basically an open air museum meant to show how Abu Dhabi was in the past.